Media Day 2017 went off without a hitch in Sacramento. The energy in the building was different and rightfully so. DeMarcus Cousins, Rudy Gay, Darren Collison and Omri Casspi, all mainstays over the past few seasons, were nowhere to be found. Ten new faces wondered the practice facility floor as the Kings begin anew with a youthful core and a handful of veterans. Plenty of players drew crowds. A 40-year-old Vince Carter fielded questions like a man ready to steal a national television job in a year or two. Fifth overall pick De'Aaron Fox is already a media darling and he isn't the only young player heading in that direction. Almost an afterthought to the day, Bogdan Bogdanovic was one of the last players to run the media circuit. The 25-year-old landed in Sacramento on Saturday evening and he had the look of the weary world traveler that he is. He took pictures and played video games, like everyone else. He even stood in for his first scrum as an NBA player after spending the last few seasons suiting up for Fenerbahce of the Turkish professional league. Bogdanovic played for the Serbian national team last week, finishing second in the Eurobasket 2017 tournament. He's played on and off all summer and has had very little time to recover before starting training camp. "I had four days, for me, that's enough," Bogdanovic said with a smile. Serbia lost to Goran Dragic and his Slovenian country mates in the finals. It was not the European sendoff Bogdanovic was hoping for. "I'm sad we didn't make it to the end, but to play in the final is a great thing," Bogdanovic said. "Still, I'm not satisfied with that. I want to be a champion one day." Bogdanovic walks into a quagmire at the shooting guard position in Sacramento. He'll battle Garrett Temple, Buddy Hield and Malachi Richardson for minutes, but don't be shocked if he plays sparingly in the preseason. The Kings are well aware of the mileage Bogdanovic has logged both on and off the court over the last few months. They'll give him plenty of time to catch his breath as the team prepares for the 82 game schedule. He comes to the United States with a built in support system in Sacramento. Serbian legends, Vlade Divac and Peja Stojakovic are members of the Kings front office and ready to support their young countryman. "They are like good background for me here, everything that I need, in the beginning especially " Bogdanovic said of Divac and Stojakovic. The NBA game is very different from what Bogdanovic is used to in Europe. The adjustment will take time, especially learning speed and the length of the players. Possibly even a bigger change is that Bogdanovic will go from a star to a player looking to find a niche. "Different roles, different roles," Stojakovic said about the transition to the NBA game on the Kings Insider Podcast. "He's going to come to a point where he realizes that not a lot of people in the U.S. care about all those accomplishments until you step on a court here and start proving yourself." 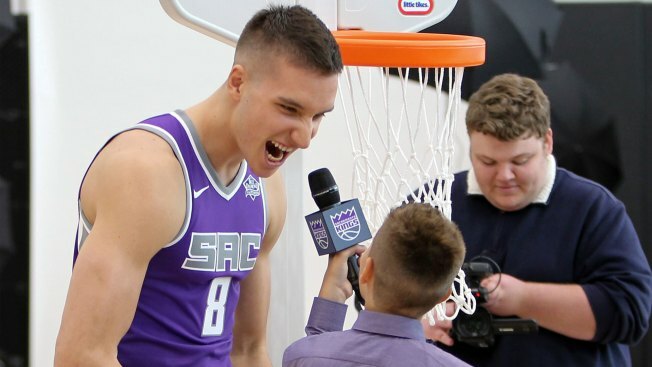 Sacramento invested heavily in Bogdanovic, signing him to a three-year, $27 million deal over the summer. He can play the one, two or three for coach Joerger, although his natural position is at the shooting guard spot. Patience is needed as Bogdanovic adjusts to the NBA and his new surroundings. The Kings will find some down time for the young wing before the season begins, but plan on him playing solid minutes once the season opens in mid-October.